Why hike to one or more Cathedral Lakes? Odds are you've never been to a place with "Cathedral" in its name where you could skip rocks, chug your choice of beverage, and give your mate a big sloppy kiss without getting into serious trouble. Crowd Factor: Hikes starting from the Tuolumne Meadows area are among the most popular in the Tioga Road region, and this one is no exception. The trail to Cathedral Lake is part of the John Muir Trail, a famed backpacking thoroughfare, and you'll almost certainly encounter other hikers on the main trail, and probably at Lower Cathedral Lake (a half-mile detour from the Muir trail) as well. That said, you'll never find Yosemite-Valley levels of crowds here. And the people you'll encounter on the high country trails in Yosemite are far happier and more polite than the people you'll meet at, for instance, your office. Scenery Factor: High. 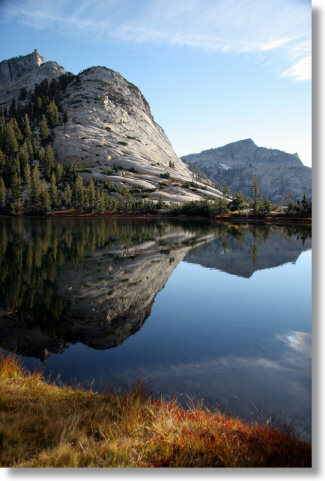 Lower Cathedral Lake is among the most impressive of Yosemite's granite-wrapped High Sierra lakes. It's surrounded by Cathedral Peak in the east and by Echo and Tresidder Peaks along the southern shore, all of them over 10,000 feet (3,050 meters) in elevation. The eastern shore of the lower lake is a wide rock shelf that, besides being picturesque in its own right, makes a great place to hang out and recover from the swamp crossing you executed to reach it. And if you trek to the far end of the lake and look west, you'll be surprised (OK, maybe now you won't be) to see Tenaya Lake lurking beneath your feet only a stone's throw away, provided you can throw a stone three quarters of a mile. Difficulty: Medium. The first half mile or so of the trail climbs steadily and you'll soon find out whether you're ready for this elevation or not. Best Time to Visit: It's beautiful whenever the Tioga Road is open - June through October, as a rule. Be prepared for marshy conditions early in the season and possible cold & storms late. Nearest Bathrooms: There's usually a porta-potty or two at the trailhead. There are bathrooms with plumbing at the Tuolumne Meadows Visitor Center, just under half a mile east. Nearest Snacks: The Tuolumne Meadows Grill/Store at the east end of Tuolumne Meadows, 1.4 miles (2.2 km) east. It usually closes at 6 p.m.
Driving Directions: The trailhead is on the Tioga Road near the west end of Tuolumne Meadows. It's 9 miles (14.5 km) west of the Tioga Pass entrance, or 38 miles (61 km) east of the Road 120 entrance at Crane Flat. Here's a Google Street View panorama of the trailhead area. Parking: There's a small lot at the trailhead, and the shoulders of the road are wide and parkable here as well. On weekends, it's not uncommon to see cars stretched away from the trailhead for a quarter mile or so. Painful Choices: You can putter along for the first three miles (4.8 km) of the trail without paying any attention to where you're going, daydreaming about work or pastries or what those letter T's carved into the tree trunks stand for (answer: Tree), but eventually you'll reach a fork in the trail and have to choose your lake. Taking the left (upper) fork will keep you on the John Muir Trail and lead you to Upper Cathedral Lake, as well as the Sunrise High Sierra Camp and Yosemite Valley if you're sufficiently diligent. The lower fork will take you to Lower Cathedral Lake. The lower lake is larger and probably more frequently visited on purpose. Trail Notes & Hazards: There are a handful of streams to ford, and the meadow you'll cross just east of the lower lake can be marshy in the summer. As always, mosquitoes will be waiting just for you in wet environments in Yosemite. The trail to the upper lake actually passes about a hundred meters east of the lake rather than going directly to it. Half a mile or so past the upper/lower lake trail fork, you'll pass a "No wood fires permitted" sign. You should be able to spot the lake through the trees off to your right shortly afterwards. The facilities at Tuolumne Meadows close a month or so before the Tioga Road itself does - it's the park concessionaire's way of keeping you from taking them for granted - so if you're hiking in October, figure on using the pit toilets at the Dog Lake/Lembert Dome trailhead instead of the decadent plumbed versions at the Tuolumne Meadows Visitor Center, and remember that your last opportunity for snacks & gas will be 38 miles west at the Crane Flat gas station. Already done this hike? Add a Review.